@LucidMusicInc really looking forward to having a fiddle with this. You boffins are very inspiring. Please for anyone using it, I'd like your feedback. I'm open to the idea of making more customisations. Are 8 channels too many? Maybe it's better to stay with 1? I'll be experimenting with other approaches so if you've got ideas/questions/problems don't heasitate to share! Update announcement. I'm working on a completely new mapping scheme which in some ways is more simplistic and yet in other ways far more interesting and pragmatic. I've taken some pointers from some approaches used by Native Instruments and while it's a headache rewriting these instinct tells me it's the way to go. Yo, anyone customized their nks case yet?? V3 is the one posted here. The files are in the top post. V4 is a completely different animal altogether. As I mentioned in some ways it's easier to use but in other ways far more complex. It's written and I'm in the process of testing it out. I'll release the files with a video as soon as I have something worth watching. In the meantime enjoy v3. Thanks for asking @LucidMusicInc Literally just picked it up. Still on V2 but it’ll more than suffice for now until I get home and see what the latest is all about. Stopped by the beach to grab some inspiration. Looking forward to V4 but I still haven’t gotten frustrated about anything in V2 yet. Granted, I was robbed of a lot of NKS time. Taking v4 on a test drive right now. still haven’t really found an issue with V2 to be honest. That said, test drive sounds like close to finish. What say you? Keeper? Or, you waiting to make another great demo video? If so, take your time. Glad v2/v3 is working out for you. I had been experimenting quite a bit with how many features I could cram into the different scenes but when using it I found it impractical. V4 has no big surprises, just a smoother easier setup and it will be released with a demo video. Gadget now remembers the midi assignment you last gave it, meaning if you had your knobs on Bilbao assigned to pad volumes and the xy on fx or whatever, the next time you load Bilbao those values will be maintained. Therefore I would suggest opening all your gadgets up and clearing out the cc assignments completely and give it a rebooted mapping. Korg you guys just keep on giving and giving! Luv it! FYI if you haven't updated your NKS, Lorg released a USB driver at the end of February this year which makes the updater software compatible again. I recently updated the firmware from 1.05 to 1.07. How do you reset the assignments? Updater software? I wish Korg would release the NanoKey utility app for iOS. I've been working on a new scene sset up all week. The idea is to write it once to the device in such a way that all the features of the hardware are fully utilised. I'll also be releasing a spreadsheet with a list of suggested mappings for each of the gadgets, starting with the drum gadgets and moving from the more simple to more complex synths. This may take some time. @WillieNegus open the mapping function window and left swipe over the parameters to delete. Repeat for all parameters. Then remap. Your new mapping will be remembered. Thanks @LucidMusicInc Looking forward to the new set/vid. Kind of wierd they just don’t have a reset to default button for the learned maps. @LucidMusicInc thanks for this, i have been fine with the mappings i did for other apps but have left gadget as is. Will update and try this out. Love that gadget retain settings. How’s it coming @LucidMusicInc? Looking forward to the next video. At some point, would like to see how you approach laying out your tracks in gadget and your other app favs with NKS. I’m focusing on Gadget and Bm3. Hey! Ok update time. I'll put the video together. Ive been a little busy but also I've sort of tapped into a goldmine of inspiration since I discovered I could remap the gadgets and the software would remember them. So what I've done is I've changed the mapping so that there are eight scenes split between 4 midi channels. Think of it like scene 1a 1b, 2a 2b etc. This gives you 16 playable pads in addition to 16 knobs and 2 kaos control assignments. Naturally with the drum machines I've been using the knobs for pad volumes. I've been using one of the kaos pads for the master volume and the other for the fx (typically set to low pass filter. It's been an interesting challenge deciding how to map the synths and in doing so I've been learning how they work and what sounds good if you modulate it. Monopoly for example has 4 oscillators, so I have four knobs controlling their individual volume and 4 controlling their tuning. Another 3 controlling the ADR of the amplitude and another controlling the ADR of the filter... on and on, it's some serious work. As it develops I can show people how to map synths and how to use the setup for performances. I did find a couple little bugs (missed a cc assignment on a kaos pad on scene 6) over the week so I'm glad I waited before releasing it. Also I have found that the pads don't work well as cc controllers because there's no two way communication between the software and the pad so their on/off state isn't remembered if you leave a scene. That's why they are now only mapped as notes, 16 over 4 midi channels, 64 pads, 64 knobs and 8 kaos pads. Provided you set the mapping up in BM3 you can also have 64 pads on any bank. When you switch a pad to keys mode you can use the keyboard. I've also tested it on Beathawk, Poison, Sunrizer, and Synthmaster. Modstep has a tendency to crash when mapping NKS. I can use Modstep a little differently however. The main functionality this controller mapping is intended for is Gadget so I'm tackling that first. Good question. I haven't found it to be that confusing. Hopefully a video can properly demonstrate that. I don’t get how you can have 64 pads and knobs across 4 midi channels. Wouldn’t it be 32 at most? Wow. Nevermind. Looooong day. 35th hour. Smooooth. So 1a+1b = 16 Recife pads + 16 Master + Gadget knobs. 2a + 2b = 16 Bilbao pads...etc. What did you decide to do with your Koas? Transport or just FX? The knobs are intended to be Gadget specific. For Recife, Bilbao, Abu DhBi and London the knobs control the volumes of each part. On synths they control other parameters. I use the vertical axis of one of the kaos pads (the lower one for example) to control the master volume and the upper pad, both axis to modulate the FX which I invariably set as low pass filter. This only allows 4 gadgets per scene using advanced mode. But it's enough, a drum machine, a bass, a lead, and a harmonic part. You can also map multiple tracks to the same midi channel. If you like to break up your drums into separate tracks the controller will still affect everything on that channel simultaneously. You can also have different set ups on different scenes in the song arranger. You can also use it in Easy mode. 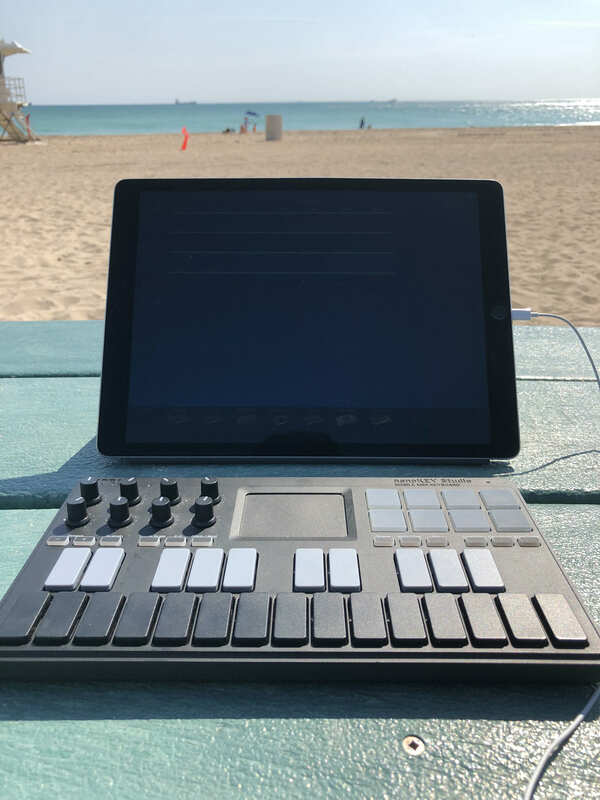 Toggling midi on a track will allow you to control the gadget regardless of the midi channel in Easy mode so that means you could have more than 4 gadgets going. Kaos pads make great volume faders by the way. You can fade in and fade out or tap the top or bottom to get a mute effect. Remember to write the global file. The kaos padded are capped at 100 so you never get an extreme volume jump. You can adjust the mixer faders for extra gain. I use the software buttons for transport. However I'm also looking to use a secondary iPad as another midi controller. If you have an iPhone you could use that. Midi Studio is perfectly set up for that.